The 2017 Jenny Lin Youth Music Program is ready to open on Monday, June 19, 6:30 PM, at the Canyon Middle School in Castro Valley. About 300 students from the Bay Area have registered to participate in this free program. Please e-mail the Foundation at support@jennylinfoundation.org for any questions. A memorial service for Jennifer Han-chi Lin is scheduled on Friday, May 26, 7:00 PM, at the Castro Valley Library on 3600 Norbridge Avenue in Castro Valley. 23 years ago this Friday, Jenny was brutally murdered in her own home at age 14. To this date, the case is still unsolved, and still very much in need of public help in solving the case. Jenny’s family and friends will gather at the ceremony to remember her. Law enforcement personnel will also be present to provide updates on the investigation effort. A candlelight walk will follow the ceremony to remind public that the murder case is still unsolved and that child safety should be a high priority on everyone’s mind. Public is welcome to join this special event. The Children’s Memorial Ceremony for Alameda County is scheduled for April 28 at 4:00 PM in Hayward City Hall on 777 B Street, Hayward. Public is invited to attend and observe. During the ceremony, all children under age of 18 who died of violence since before 1994 will be remembered through the reading of their names. This event is being organized by the Children’s Memorial Committee of Alameda County led by retired Alameda County Supervisor, Ms. Gail Steele. For more information please contact Ms. Steele at 510-538-9422. The poster for the 2017 Jenny Lin Music Program is now available. To view or download the poster, just click here. Click here to read about the announcement of the Jenny Lin Summer Youth Music Program on the latest issue of Castro Valley Forum (Page 2, bottom half section). The 2017 Jenny Lin Youth Music Program is now open for enrollment. Click here to enroll. Season’s greetings! If you are making year end donations, please remember to give to the Jenny Lin Foundation, a community oriented non-profit organization that invests all its resources in making a safer and more caring community. To make a credit card donation, click here. Further, if you shop online for the holidays, please shop at Amazon Smile, so Amazon.com will make a donation to the Jenny Lin Foundation. On April 22, 2016, at 3 PM, a ceremony will be held at the Cathedral of Christ the Light on 2121 Harrison St. in Oakland to honor all children died of violence under the age of 18. Following the ceremony, a dedication of the Children’s Memorial Statue will take place at nearby Garden Center by Lake Merritt. 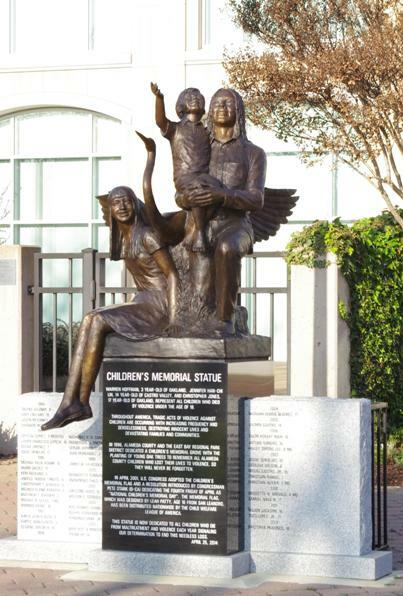 The statue is a sculpture of three children, Jenny Lin (age 14), Warren Hoffman (age 3), and Christopher Jones (age 17). They represent all children who died by violence under the age of 18. The statue was dedicated to all children who die from maltreatment and violence each year signaling our determination to end this needless loss. The statue project was a result of a relentless effort by Ms. Gail Steele, retired Alameda County Supervisor, and a group of victims’ parents, including John and Mei-lian Lin. Looking for something fun and musical this summer? Join the free Jenny Lin Summer Youth Music Program!